The heat blasting from the train’s firebox was overwhelming. As we flung coal in, stoking the HMT Warrior to attack speed, the ends of my hair blackened and curled, while sweat soaking me from head to toe. 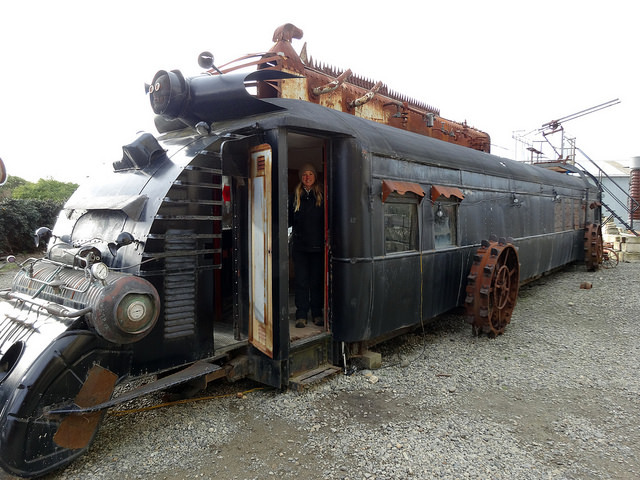 “Faster!” Commissar Meyer yelled over the rattle of steel wheels on vast tracks. Meyer’s hand was on her pistol, her eyes scanning the work crew for signs of dissent. I glanced out of a porthole. All four trains of the assault fleet were accelerating over their freshly laid tracks, past the blasted bodies of the navvies who had prepared the way. There were worse fates for a poor labourer than a Leviathan’s engine room, though none of us would have chosen the lives the Party gave us. The pain of a blow to the back made me twist around. “Less gawping, more shovelling.” Meyer pointed her baton at the heaps of coal, and then at the gaping maw of the firebox, an opening wide enough for all six of us to shovel at once. Beside me, Kemper began a shovelling shanty. We all joined in, the rhythm setting our pace, the singing keeping our spirits from collapse. Our percussion was the bouncing of shells off the engine’s armour and the roar of explosions, a sound we dreaded hearing up close. It was hard to pierce a Leviathan, but the consequences were terrible for labourers, officers and technicians alike. A roar shook the engine carriage. We staggered as the whole machine swayed from side to side. It crashed down onto the rails and burning coals flew everywhere. Sebranek fell screaming to the ground as smoke poured from her body, and then fell silent. “Keep shovelling!” Meyer had dropped her baton, but she still glared at us with the same ferocity. Slowly, Kemper turned and began his song again. I stooped to retrieve my shovel, but that brought me closer to Sebranek’s body. The stench of burnt flesh turned my stomach. This was no way to live. I didn’t care what those rebels at the end of the tracks had done. I wasn’t willing to burn to death at the order of the Party and the whim of fate. As if to make my point, another shell bounced off the roof and exploded close by, rocks rattling against the portholes. Meyer glared at me. My fellow stokers looked away. “Back to work, or I’ll blow your brains out.” Meyer drew her gun and pointed it at my head. I hesitated. If I kept shovelling I might die. If I refused I was making it a certainty. “Last chance.” Meyer pulled back the hammer of the gun, the click piercing the dull roars and low rattles around us. She looked so calm, she must have done this dozens of times before. I thought of all those men and women, of how they must have picked up their shovels again and decided to live. It was the only decision that made sense, but it was a decision that ensured the train would continue, stokers feeding the engine forever. How could my death change that? I stooped, fingers closing around my shovel. Shame filled me as I prepared to turn to the firebox. An explosion roared outside. The Leviathan swayed, coals tumbling from the firebox’s mouth. We staggered across the deck. Meyer’s gun wove wildly through the air. I leapt at her. There was a crack as my shovel hit her arm. The gun clattered to the floor. Another crack as I hit her across the side of the head. She fell to the ground, blood seeping through her hair. The others stared at me in horrified amazement. Were they waiting for me to tell them what would happen now? I had no idea. Kemper walked over to the door and slid his shovel through the handles, barring it from the inside. He pulled the emergency release and the firebox door slammed shut. The Leviathan slowed as he picked up the gun and came to stand beside me, a small smile on his calm face. Outside the door, authoritative voices were raised in alarm. “Oh a brave new world will come,” Kemper sang. Together we raised our voices, drowning out the fear with words of hope. This story is set in the same world as ‘Broken Rails‘, a story I put out in December. My friend Si asked for more, so here it is. The tone is rather different, but I’m pleased with how the setting is shaping up. If you’ve enjoyed one of these Friday stories and would like to see more like it then let me know – I’m open to requests. 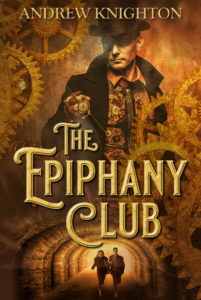 And if you’d like to read more of my steampunk then you can sign up to my mailing list for a free e-book of my steampunk collection Riding the Mainspring and a short story straight to your inbox every Friday.